I attended a ‘meet the brewer’ event at Mr Foley’s Cask Ale House in Leeds last night, hosted by the genuinely nice guys from microbrewery Ilkley Brewery. It was a great opportunity to learn more about Ilkley beers, and to meet some fellow beer bloggers in person for the first time, but the thing I took away most from the night was a better undserstanding of the thought process of brewers like Ilkley. The thing that’s great about small brewers is that they are first and foremost beer enthusiasts; who happen to have the capacity to brew some beer that they think will taste good. It's really that simple. Hearing the guys talk about beer totally in terms of flavour without even a sniff of 'we wanted to tap into so-and-so market' was really refreshing. Another thing which was really interesting was the information about the 'structural' benefits of certain hops. This was something that I've never really thought about or discussed before and it was really very clever stuff indeed. 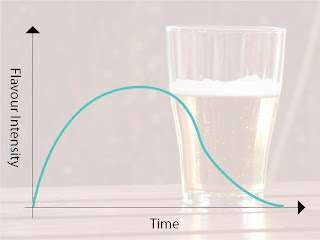 A well balanced beer has a flavour which carries through the beginning middle and end, so if you imagine a chart with flavour up the side and time across the bottom a well balanced beer will produce a smooth curve that doesnt drop off at any points along the way. The problem when producing hop driven beers, as Ilkley like to do, is that certain hops engage the mouth at different times, so if you produce a single hop beer you have to use loads of it to produce a lingering hop flavour that lasts in the mouth. Use too little and the hop flavour will peter off too quickly, or not show it's head early enough and then cripple you with dryness in the finish. It's a balancing act that I've tasted and acknowledged in beers before, but never really fully understood until the event last night. 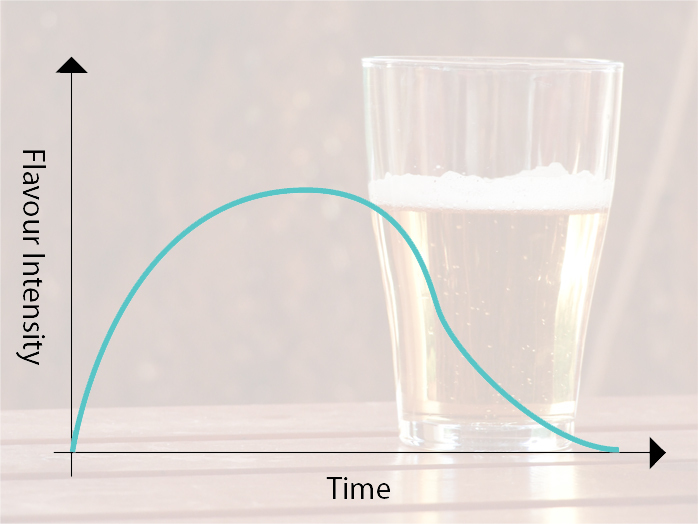 The really clever thing is that you can use a small amount of certain hops to 'prop-up' the main hop which would otherwise drop off the flavour curve somewhere along the way. The example they gave (if my memory serves me) is that in a Citra heavy pale ale a small amount of Cascade can actually help the Citra hop flavour carry right through the beginning, middle and end of the beer improving it's overall flavour. Thus giving a better overall hop flavour throughout the beer whilst still maintaining a clear and strong citra hop flavour i.e. the Cascade 'props up' the Citra. Interesting no? They also talked about how dark malts mask the flavour of hops, making Black IPA's particularly tricky buggers to get right, as was demonstrated by their promising but not-quite-there-yet 'Black Summit' - a Black IPA based on their popular Lotus IPA. I agreed with the brewers comments that it needed a little tweaking before it was perfect; it needed to be a bit darker, a bit more complex and much hoppier. I'm confident it'll be a great beer once they get it right though as the other Ikley beers are top notch. Mary Jane 3.4% - A Session strength Pale that uses loads of Amarillo giving it a nice sweet orange and grapefruit note. For a session beer it's got loads of flavour and the hop profile is really nice and strong. Interestingly they told us that Amarillo is a mutant hop that spontaneously grew in one producers hop fields, and unlike nearly all other hops he has a trademark on the name. Now it's become popular he's raking it in as no one else can grow it! Ilkley Black 3.7% - A pretty decent session Dark mild that the brewers told us they introduced as a response to a brewery tour by the local Camra branch (make of that what you will) it's not particularly exciting but for a low ABV dark mild it is pretty on the money. Nice mild roastyness, hints of milk chocolate and malt with very little hop character. It apparently sells very well locally, which you can't really argue with. Ilkley Pale 4.2% - This hoppy Pale Ale was my favourite of the night. For a mid strength beer it is bursting with flavour from the juicy Nelson Sauvin hops, has a really nice floral bitterness without being too aggressive, and a fresh citrussy finish. Really nice and a perfect beer for supping in the sun. Black Summit 5.0% - This black ipa was a touch dissapointing on the night as I already mentioned. But from what the brewers said this beer is currently a work in process - By the time most people drink this it should be spot on. These guys know what they're talking about, they know how to brew good beer, and I look froward to trying this once it's been perfected. P.S. Was great to meet the gaggle (bloggle?) of Leeds Beer Bloggers from Hopzine, Beer Prole, Good Stuff, Ghost Drinker and many more who I'll thank on Twitter.